ARCHITECTS, CONTRACTORS, AND DEVELOPERS demand the most advanced in architectural sheet metal products. This requires experience, creativity, and dedication. Our capabilities are based on these standards.Weiss Sheet Metal started in business in early 1943 in Southern California. By 1960 the company was growing and diversifying and expanded by creating Metcoe Specialties. Metcoe is a manufacturing arm that has become known for nationally recognized branded products. 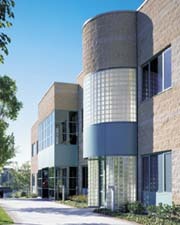 Included are the trademark skylights, and spring-lock reglet and counter flashings in demand by architects everywhere. 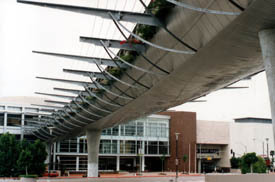 Metcoe skylights have been employed in projects such as the Ontario International Airport, Ontario, CA, the San Diego Convention Center, San Diego, CA, and the Museum of Science and Industry in Los Angeles. Weiss Sheet Metal, the parent company, has continued as a contractor and manu- facturer of basic sheet metal products. 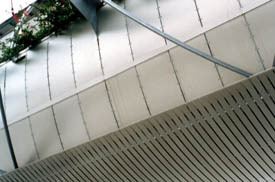 The company offers an array of custom and intricate designs and applications used for column covers, panel systems, louvers, roofing - all using metals such as pre-finished aluminum, pre-finished steel, copper, and other metals as specified by architects.With the growing demand for custom and intricate design and applications in the architectural metal industry, Weiss established Global Architectural Panels to meet that growing market. It's not just the fabrication that calls for expertise but also the application. 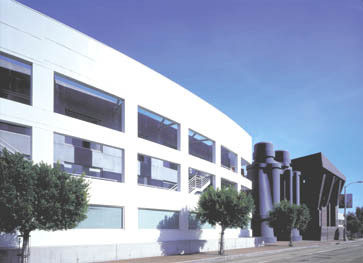 Weiss was the sheet metal contractor on the two-story Chiat/Day Advertising building in Venice, CA. The project called for the precision installation of 16,000-square-feet of 22 gauge pre-finished white and galvanized cladding, as well as 15,000-square-feet of 16 ounce copper panels. The major challenge in both fabrication and installation was because of the length of the panels - the pre-finished white panels and galvanized cladding panels averaged 5 feet by 15 feet and the copper panels averaged 2 feet by 4 feet. It was a six-month installation project that had to be accomplished in less than three months. It was a design build project for Bloomingdale's department store in Century City accomplished in coordination with the contractor. 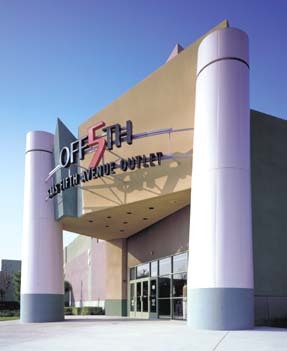 The project called for Global to produce the aluminum wall panel system that would provide the 70,000-square-foot exterior skin (cladding) on the store, as well as fascia, soffits, canopies, and the 15 foot tall 3 foot in diameter custom painted column covers, all in 0.125 aluminum. With the Weiss crew of more than 20 journeymen working steadily, the installation was completed in two-and-a-half months. 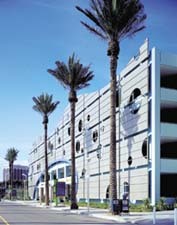 The installation of the aluminum wall panel system called for on the Queensway Bay Parking Structure adjoining the Long Beach Aquarium turned out to be one of the largest and most unique projects for Weiss. While the 0.080 aluminum panels themselves were fabricated in the Weiss Gardena, CA facility by Global, the 60 individual 12 foot by 24 foot frames were assembled in large sections in the field, and lifted into place with cranes. The designers had called for laser cuts depicting bubbles. This work was accomplished skillfully in the Weiss production facility. 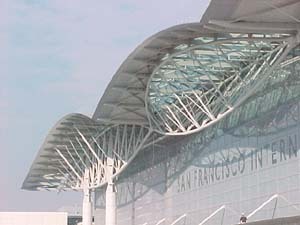 The designers had called for a crashing wave effect on a large portion of the roof - initially suggesting that zinc would be the metal most suitable. When Weiss was awarded the contract, our designers and engineers very strongly suggested that a better metal to use in the atmosphere near the ocean in Long Beach would be aluminum. The aluminum panels, which varied in length from 5 feet up to 30 feet long, were 18 inches in width. 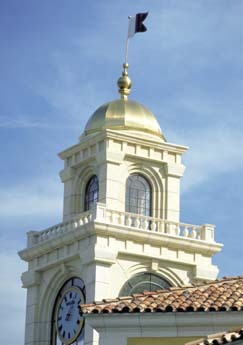 A fully detailed description of this roofing system was featured in the November 1998 issue of The Roofing Specifier. Efficiency and expertise are the name of the game when shop drawings arrive at the production department for every type of product for Weiss. Experienced craftsmen are selected to handle each and every job according to their individual skills. While one crew may excel in press brake fabri-cation, others will handle shearing, or soldering. 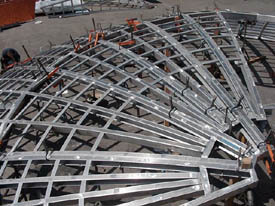 Some are more skilled in working on projects that call for radius forming. The shop personnel at Weiss are highly trained, and they average ten years with the company and on the job. Such was the case recently when Weiss was installing Monumental Skylights by Metcoe Specialties at the Ontario International Airport in Ontario, CA. There were some job site conditions which required immediate design modifications. The Weiss team of eight performed their duties flawlessly meeting a difficult challenge. The project for Weiss was completed in a timely four-month period. Custom fabrication and istallation of 16 gauge Stainless steel oxford pattern siding. 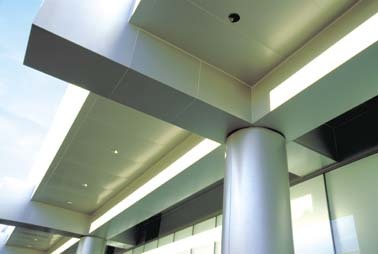 Brushed finish soffit radius panels. 16 guage stainless steel perforated canopy panels. 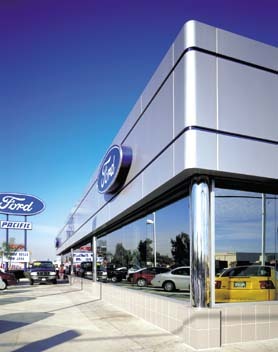 16-guage stainless steel perforated canopy roof panels. The bridge is approximately 600 feet long over an existing roadway, covering an area over 40,000 square feet. This project was fully designed, engineered and fabricated by Global Architectural Panels and installed by Weiss Sheet Metal Co. 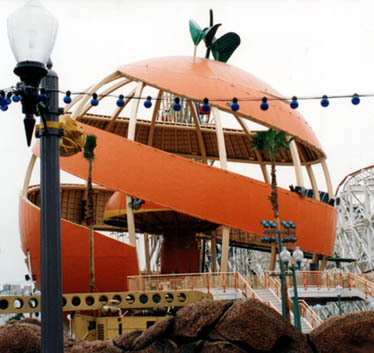 If New York is The Big Apple, then Anaheim must be The Big Orange. 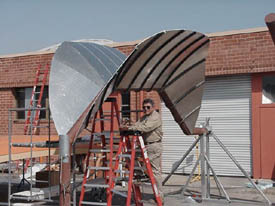 The artisans and craftsmen at Weiss Sheet Metal Company Inc. in Gardena California helped with the design, fabrication and installation of this one of a kind unique attraction at Disneyland. Using the latest design and technology the orange was designed to look as if it were being peeled. The orange skin is .060 stucco embossed Aluminum dimpled to actually look like an orange peel. The subframing is made up at 2"x4" Extruded Aluminum tubing. 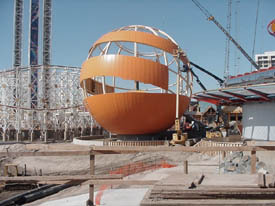 Each piece was prefabricated to match the curvature and radius of the orange to help in the installation at this most impressive project at Disneyland. The entire project was designed in a 3-D AutoCAD environment. All panels were sized in the Cad program and fabricated from their dimensions. The system was designed for L/360 deflection criteria. Global Architectural panels in cooperation with Weiss Sheet Metal designed, engineered, manufactured and installed over 60,000 square feet of 3/16" thick plate aluminum panels on this job. 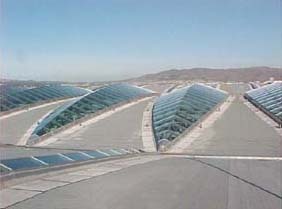 Nearly 3000 pieces of insulated laminated glass were used in the parabolic (elliptical shaped custom metal framed skylights), including the 700 foot long glass canopy, covering 40,000 square feet of area.